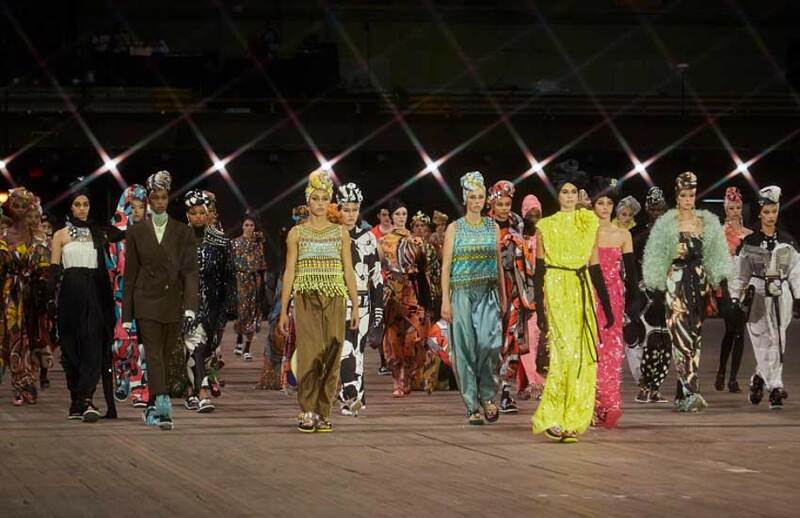 Marc Jacobs Spring Summer 2018 RTW collection was colorful and exotic with eastern-inspiration. View the gallery and see what we think about it! 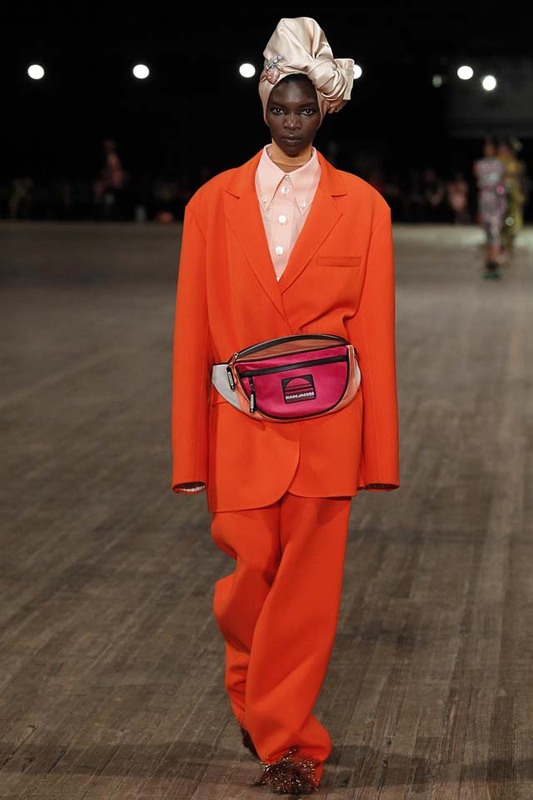 The Marc Jacobs Spring/ Summer 2018 RTW collection at New York Fashion Week started with no music and vague bright-colored oversized pant suits. Worn with turbans. And cross-body bags. And fanny packs. So random. 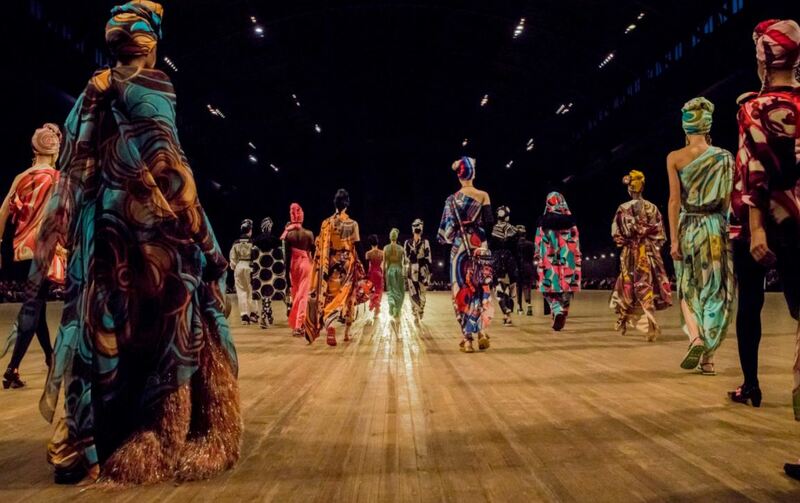 But as the fashion show progressed, the looks moved on to exotic kaftan-inspired jumpsuits, colorful sequin gowns, bright one-shoulder harem jumpsuits with ankara-inspired prints. The turbans were omnipresent in all the looks, along with the bright colors and prints reminding us of exotic African fashion. By the end of the show, even the woody empty wide court that acted as the runway began to transform into a desert in my mind. All very vivid. All very flamboyant. It reminds me, as I mentioned, of Africa. And yet it was not really African-inspired fashion. It just reminded me of that. Just like what Marc Jacobs always does. These dreadlocks from SS17 collection are not really dreadlocks. This Gothic outfit on Lady Gaga is not really goth. Well, err… actually that’s very goth. But, ummm… anyway… coming back to the Marc Jacobs Spring/ Summer 2018 RTW collection! Only when the show ended and I looked at these pictures again, one by one, did I realize – it’s more like an American tourist in Africa. The large bags, the long gloves, the fanny packs, the fur slippers and the over-the-knee boots – these are not exotic accessories. They are just in the vicinity of exotic items – the harem-inspired track-pants and the ankara-inspired prints and kaftan-like coats! Some of the familiar faces we spotted in the show were Kendall Jenner, Bella and Gigi Hadid. Kaia Gerber walked wearing the final look in a yellow gown and long gloves. Her mother Cindy Crawford was also at the show to support her. Niki Minaj was spotted, too. So let’s see what the verdict is on these looks: Chic? Most of them? Wearable? Certainly. At least some of them! So, yeah. For the rest of the looks – certainly not! Memorable? On a whole, yes. Desirable? Very few of them – I wouldn’t mind that one-sleeved kaftan jumpsuits, beaded tops and track-pants and Kaia Gerber’s dress! !